Head west from Bermuda towards the East cost of Georgia, navigate up the Savannah River, and you’ll find one superyacht refit yard, undergoing… well, a major refit. These are exciting and ambitious times for Savannah Yacht Center. While continuing to provide service and refit works to some of the largest superyachts, the yard has also embarked on an impressive redevelopment programme that will see numerous aspects of the yard evolve by mid-2018. 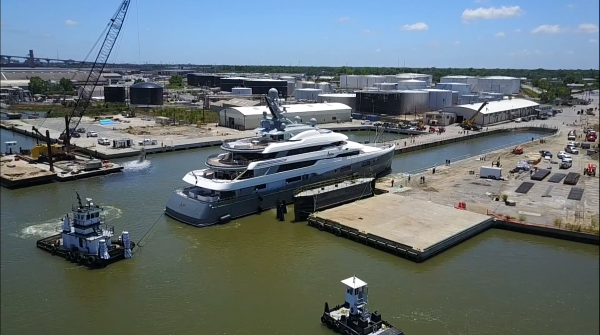 Indeed, no sooner had Savannah Yacht Center completed its recent upgrades to the 140m dry-dock, did Aviva, the 68m steel hulled Abeking & Rasmussen motoryacht, use the dock for a four-week service. Now approaching the end of its service works, the 2,047gt motoryacht will be launching from the Georgian yard this month, before two further vessels, scheduled for quick turnarounds in June and July, take its place. In addition to new workshops, offices and a crew amenity centre, Savannah Yacht Center is capitalising on its relationship with on-site coatings partner Pinmar USA, who is assisting with the design and development of its paint facilities, ready for operation towards the end of 2017. Excited with the progress of construction, Phil Burgess, general manager of Pinmar USA, stated that Savannah Yacht Center “will be one of the largest and best equipped superyacht refit facilities in the world”. A new rail transfer system capable of providing safe and efficient transfer for more than six 80m yachts simultaneously, and a new 3,240-tonne capacity shiplift due for installation in Q1 of 2018, certainly endorse that claim.